How do I interpret the visualisation? Each participant's comment is represented by a coloured circle. The size of the circle relates to how a comment is being rated by the community. Participants are grouped according to their response to the poll question in Step 1. The percentages reflect the proportion of the entire community that selected that response option - this determines the size of each group. Your comment is the green circle. This contains your comment and any replies you have received. How can I tell how many participants there are? The overall number of participants (defined as people who have responded to the poll question) is shown in the blue callout next to the title. The number of participants shown in the visualisation is determined by your screen size. When there are too many participants to show, Crowdoscope will only show a sample of participants. In Step 2, why do I have to rate a number of comments to progress? You are required to rate a sample of comments in order to ensure that all participants' comments have received an equal amount of attention from the community. The number of comments you have to rate in Step 2 is determined by the administrator. What am I supposed to do in Step 3? You are free to explore the comments of other participants. Rate and respond to as many comments as you like. The control panel on the left helps you to navigate the discussion. Here you can track your previous interactions, get feedback on your own comment via My Stats, see the most frequently mentioned words in Filter by Tag, and view the Top Rated Comments of the whole community. What happens if I click "Follow"? Follow allows you to keep track of comments and discussions that you are interested in. If you select follow, the comment will appear in the "Comments I've Rated" section as a grey circle with a coloured outline. If you reply to a comment, it is automatically followed. By selecting "Home" the visualisation takes you back to an overview of any comments that you have not yet rated. What does "Top Rated Comments" mean? The Top Rated Comments are comments that have been rated most highly by other participants according to the first evaluation criteria (this is detailed in the instruction at the top of the control panel). What is "Filter by Tag"? Filter by Tag allows you to view comments that mention frequently occurring keywords. In this way you can dig down into topics you are particularly interested in. What does "My Stats" mean? My Stats is only visible to you. It provides an overview of your interactions with other participants. Click "Comments I've rated" to display all the comments you have rated - comments you are following, or have replied to, are highlighted with a coloured outline. My Stats also shows the number of ratings your comment has received - the two bar charts as the bottom of the control panel show how other participants are rating your comment in relation to the evaluation criteria. Can I log back in to participate further? Yes, you are encouraged to log back in to see how your comment is being rated, the replies you have received, how discussions are progressing and to rate new comments. For further support or information about Crowdoscope please contact hello@crowdoscope.com. 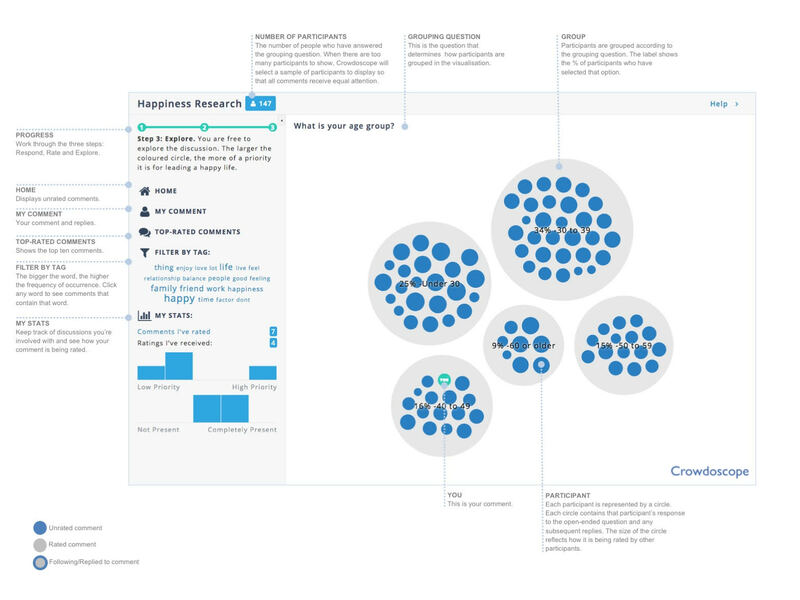 Crowdoscope is a research tool for obtaining the collective intelligence of groups of people. It is a self-organising visual environment that can support an unlimited amount of participants. In Crowdoscope, groups can interact in a system that has been carefully designed to optimise their input and extract insight. In this way, Crowdoscope helps communities to navigate discussions more easily, facilitates collaboration and enhances participant involvement.